The one Elder Scrolls announcement of Bethesda’s E3 showcase that everyone assumed to be a joke is, in fact, real. Skyrim Very Special Edition is a version of Bethesda’s most-ported game for the Alexa, although it’s fair to say it arrives in stripped-down form. 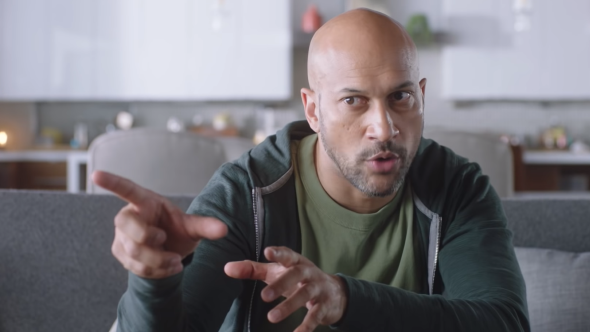 Given that the trailer for Skyrim on Alexa featured sketch actor Keegan-Michael Key, you can be forgiven for assuming it was, well, a sketch. But Bethesda have followed through on the joke, releasing a voice-activated edition of the game that’s free to enable on the US Amazon store. The listing encourages you to “explore Skyrim using the power of your own voice,” and presumably works just as it did in the trailer – as a choose-your-own adventure you can enjoy by talking to yourself in your living room. Skyrim is not only the finest RPG on Alexa but also one of the best RPGs on PC. Bethesda promise questing, weapon mastery, spells, shouts, and “people who constantly need your help”. There’s also a reference to guarding your knees against arrows and walking straight up mountains instead of going around, so it’s fair to say the self-awareness is at an all-time high on this one. Skyrim for Alexa is currently on the US store only, so no coffee-table clearing fus-ro-dahs for us in the UK just yet. Of course, there were a few Skyrim for Alexa spin-offs announced at the Bethesda show too: The Elder Scrolls: Blades, a Fruit Ninja-ish, mobile-first game about hacking enemies in procedurally generated dungeons. There’s new dungeon and story DLC coming for The Elder Scrolls Online, and a graphical update for The Elder Scrolls: Legends. Oh: and they’re currently making The Elder Scrolls VI. We also have a rundown of absolutely everything that happened during Bethesda’s E3 conference, so check that for news on Rage 2, Fallout 76, Wolfenstein: Youngblood, and DOOM: ETERNAL. You’ve got to use the caps.